Where do I get the HTML code for the stamp or do I cut and paste the stamp? I got my secretary to cut and paste. I would like to thank the judges at the American Wine Blog Awards for their oversight, the Lodi Chamber of Commerce for their insight, and the American Squirrel Awards for their website. I join with my esteemed colleague, Arthur, in saying, I am honored. Thanks, I am honored and you know to whom to pay respect. Lots of loaded words here. This is an awesome honor. Having grown up in a neighborhood called Squirrel Hill, it feels very full-circle. I may have to start blogging now just so I can win another one next year! Should I be honored or disappointed that I didn’t win anything? We squirrels are sensitive types, Dale. But we have much love in our hearts. So we have bestowed an Award upon you. Congratulations, you’re a Winner! I didn’t win. No respect, I get no respect I tell ya. Write the award you’d like to get on the back of a $100 bill and mail it to us here at Las Flores View Point Squirrel Colony. To us, you’re a Winner! Who’s running these awards, anyway? The Wine Spectator? I’m very honored to win this award since most of the time it feels like I’m blogging about herding squirrels in Texas. Thanks for all. As you can tell by my blog…I am not computer literate! couldn’t have done it without you 2B! Geez, I thought I’d never win anything. With my faith restored, I shall blog on. Have you any red squirrel awards? Wow, I’m honored. And squirrels are like *totally* cute. I couldn’t be prouder, more honored, more flattered, more shocked. To be given an award for achievement is wonderful– But to be given an award for something one has not yet done is paradise! Squirrel can get a handful of peanuts in my park any day. Finally, acknowledgement from a fine furry institution about the glories of the Morris. I thank you and Morris Dancers of the world thank you! I guess playing all that Squirrelbait on the radio back in the day has finally paid off. PS: Is that McGruff the Crime Squirrel? Wow, nice to see so many of my friends and peers achieving true greatness. It would have been too serious to give a special award to Franco Ziliani of VinoWire for his nearly real time coverage of the Great Brunello Scandal of 2008? You are not in charge of this blog. You must ask Morton Leslie. I sent an email to Morton Leslie, told him of this space. Still waiting…..
prodigious…prodigious… that could mean like comparing me to a prodigy couldn’t it? But then, it could also mean extraordinary in bulk. Hmmm. Well, either way I’m very proud that a fictitious commenter could rise to such heights. It has given me needed encouragement and I promise to redouble my efforts as well as my word count. Oh, and it’s okay Robert feel free to make any suggestions you wish. It’s a real honor to have a Squirrely Blog. Isn’t that suit that squirrel is wearing standard Blue Note issue? It’s flattering to be part of such a distinguished group of professional drinkers. Thanks to the academy. Thanks for the award little fellas. I know it had nothing to do with the 99 cent jack in the box tacos I accidentally left behind on my last trip up the I5. Because of you I am now not only a bona fide, dignified, glorified alcoholic, but also a pervert. p.s. Hope you got the photos of the 4 super tuscans. I now relate them to women with plastic surgery. Lastly, question…what Italian ever came up with the name super tuscan? Does that mean they wear skin tight shirts, gold chains, and drink Zima? Thanks for noticing. I rarely get to break out my BN suit. I borrowed the hat from Lester Young. I think Herman Leonard took a great shot. Oy! This is perfect for people like me who would never win any other wine blogging award. How about “Best Astrological References, that – yes – tie into wine” ? It might encourage me to write more about astrology, as I sip my wine. Thanks for the opportunity to shine! BTW – before I forget – this award is very important to me. You see (And I’m not making this up. It’s way to complicated.) my great grandfather (six times removed) William Blackstone was sent over by King James to preach the King James version of the Bible. He landed on a piece of property (and subsequently owned 80 acres) for what’s today called Beacon Hills and the Boston Commons. So, whenever I’m in the Commons, I look at the squirrels knowing that we’ve both filtered down from a time where our descendants crossed paths. I once got attacked by a squirrel that somehow got into my closet. Does that count? Don’t forget to add the “I’m a Winner” stamp to your site. Whohoo. I can’t wait to add “I’m a winner” to my site! I wonder if your attack was anything like mine in my closet. Some bees had come in with the laundry my mother had hung on the clothes line. In a moment of drama, I threw myself into my closet to comfort my anger and tears. I got stung, felt the pain through my shock, and threw myself back in for a second time (what are the odds? ), only to get stung again. I then got over whatever had caused the drama, and have not thrown myself into a closet since. Wow. And I thought nobody read my blog. Apparently, the Squirrel nation likes caves. 🙂 Thanks for the acknowledgment. Michael – we read you. Yeah, we read you. Zima was my mother’s name. and Corona was my dad’s name. Watch it! Can I have “Most Infrequent Wine Blogger Because He Spends Too Much Time on Twitter and Facebook”? 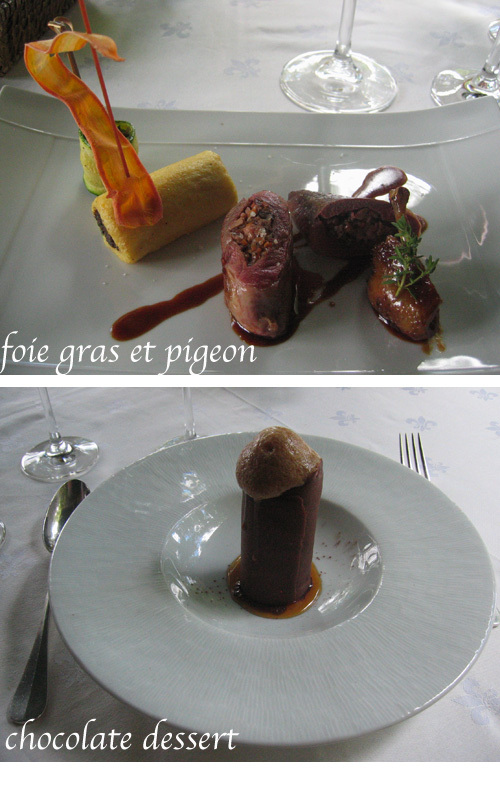 BTW – Squirrel needn’t fear the kitchens of Healdsburg – the pairing choices are too complex! Kidding. These are so great and truly, squirrels are adorable! Cheers! Parody? Written by Squirrels? What’s he talking about? 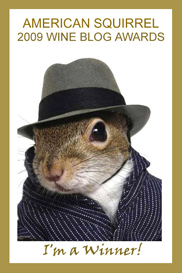 These American Wine Squirrel Blog Awards are serious stuff ! Do I smell an anti-squirrelite? So there you go El Jefe. sephage brought out the garden hose. grab your camera and get to work. if you bloggers want an award there’s work to be done. I’m so sad. I love both of those squirrels on the masthead and I can’t decide. I once mothered a couple of baby squirrels after a big bad car ran over their mommy! I’m surprised you don’t remember that Sgt. Sassafras! Where’s the love? So there I am i some little borgo in Tuscany without WiFi wondering what those Facebook messages were all about. And now I know. Um. Where is this leading? Well anyway, seriously, folks, I’m glad to accept this award on behalf of all the other craven wine-blogging bastards out there. It is truly an honor. I love you, man. Peace out. PS — Stay tuned for EXCITING WINE NEWS from Italy at mondosapore.com!!!!!!!!!!!!!!!!!!!!!!!!!!!!!!!!!!!!!!! PPS – Charles Scicolone has no hair. He stole the wig from an orthodox Jewish lady in Borough Park. Can I send over Sasheen Littlefeather to pick up my award for me? oh…. *breathing* *panting*, thank you *tearing up*…I’d like to thank god (that would be Bacchus, folks) …and the spirit of the grapes (Demeter) and the soul of the vintner (Paul Clifton 🙂 …for recognizing my shenanigans …and spell check for having shenanigans in its dictionary. And Bacchus Bless You all. Hey, that’s no prop. I really wear hats. I think I should win a squirrel-y as Best Wine Blog by a person who hates squirrels because I’m pretty sure they eat my hollyhocks every summer. Can I have a badge, too? There has be something I can be nominated for! Let’s see, I’m well over 50, I’m female, I’m Black (oops … “African-American”), I love to write, and I live in Las Vegas. Let me mull that one. There’s *got* to be something unique in there somewhere! Tragically, I`m not american but a Dutch winewriter about Italian wines. Please visit mine blog, it also many times translated in Italian language. I have awarded myself for the most egregious exploitation of a rodent var. vinifera on the Flod Blog, the home of so much that is flod. how about an award for best winemaker/importer /musician with a blog, or at least a Twitter account? I started writing too late for consideration in 2009. Keep me in mind in 2010. Thanks, and keep up the good squirrels. Please can I be considered as a candidate for Best Wine Blog That Mentions Wine Very Rarely But Uses Long Words category? How about best wine blog that doesn’t have the word “squirrel” anywhere on it? …yet. Thanks for sharing this kind of information. I have been looking for it for a long time. Suchst du Blind Date , mit Sicherheit bist du hier genau richtig.Ok los geht es,stellt sich die Frage,worauf wartest du? Heiße Live Chats ficken parkplatz ,sofort anmelden . Suchst du jemand aus Thun, vieleicht aus Vevey, oder Zwickau , vieleicht von Cham, oder aus Bern? Mit Sicherheit kein Problem. !